5 Ideas For The Bride Who Doesn't Want To Show Too Much Skin! This goes out to all the brides who are beginning their shaadi shopping ,especially picking out their main wedding attire. The wedding is your time to shine, the spotlight is on you and you’ve got to be super confident whilst meeting all the guests and participating in the celebrations! The last thing you want is to be bothered about too much skin showing. So here are some modest outfit ideas for brides to make their choice easier! 1. High Necks For The Win! Image Source: Sabyasachi Mukherjee On Instagram, Ami Patel On Instagram It’s back! High necks with a lot of detailing on the neckline are back in all their glory. You have to agree that maharani necks in blouses and kurtas look very classy. It spells grandeur and elegance in the most purest form. Get an embellished neckline and if you’re going for a solid bodice, select a heavy, glittering dupatta to go with it! That will complete the look beautifully along with a pretty up-do! 2. An Interesting Back Is Always A Good Idea! 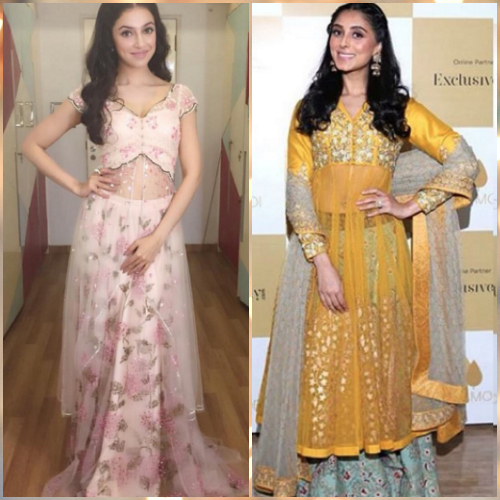 Image Source: Karisma Kapoor On Instagram The most comfortable and easy way of showing off skin (in a subtle way) is decorating the back of blouses and anarkalis. You want to dress appropriately but not be covered in fabric from top to bottom. 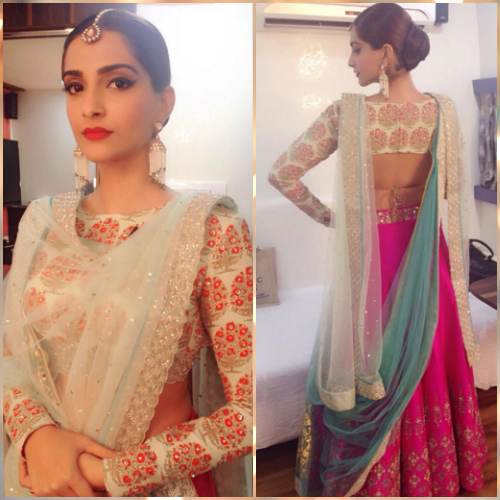 An open back is ideal when you want to wear a longer choli but feel that it’s too covered. A hint of skin not only adds a sophisticated touch, it looks graceful too! 3. The Magic Is In The Way You Drape Your Dupatta! 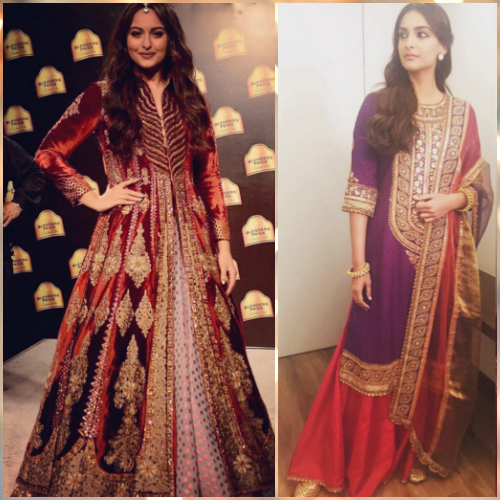 Image Source: Rhea Kapoor On Instagram Opt for a georgette dupatta with heavy embroidery if your blouse is a bit tiny to feel more comfortable. Get sequins sprinkled all over a net dupatta to increase the opacity of the fabric. The real deal is in the way your drape the dupatta. For more coverage, go for a seedha pallu. 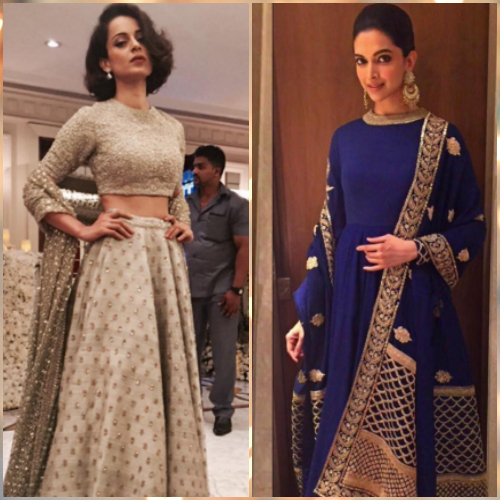 Keep it neat with small pleats if you want your blouse and lehenga to be more visible. 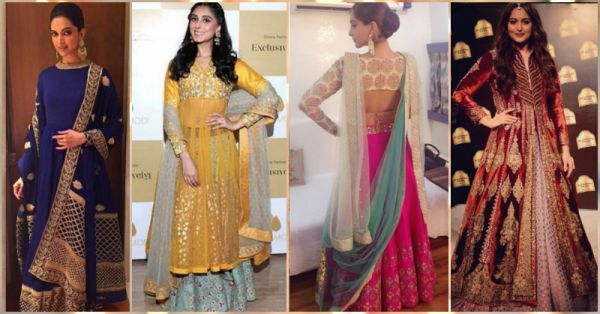 Also read: 7 Brides Show You How To Style The Double Dupatta! 4. Sheer Goodness Is For Real! Image Source: Shehlaa Khan On Instagram, Anju Modi On Instagram The trick to get more coverage but still let the skin peek a bit is through fabrics like organza, tulle, net etc. Get net sleeves if you are conscious about your arms. Go for a short choli but get an extension in net in an A-line cut that covers your stomach. This way you are subtly showing off skin and you’ll feel more confident about it too! Net dupattas also aid with this! 5. Ditch The Blouse And Try This instead! Image Source: JJ Valaya on Instagram, Rhea Kapoor On Instagram, Want to forget about short blouses all together? There are a plenty of different and interesting options, especially on the sangeet night when you don’t want to worry about skin show while dancing. A long jacket on top of your lehenga, a peplum blouse, or a long kurti with your skirt are amazing too! Also read: Get The Sexiest Blouses With These Interesting Backs! HAVE A STORY IDEA FOR POPxo? If you want to hear about it, we can write about it! Just tell us your idea here!